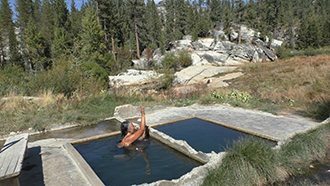 Mono Hot Springs Resort is about as remote as you can reach by automobile in California’s Sierra Nevada. Located between Yosemite and Kings Canyon on the west slope of the Sierra’s you’ll find over a dozen natural mineral hot springs running along the south bank of the south fork of the San Joaquin River with cabins at the resort, a restaurant and camping. You can reach these rustic hot springs in the Mono Basin – not to be confused with Mono Lake on the east slope of the Sierra – by traveling over 9,100 ft. Kaiser Pass Road with spectacular views of the “Range of Light” that is some of the most beautiful light colored granite in the Sierras Nevada. After nine miles of paved but much of it one lane road, turn onto the well-marked Edison Lake Road dropping down and crossing the San Joaquin with the turn off to the resort just past the bridge over river. There are three ways of accessing the hot springs at Mono. One way is to park your car at the day use parking lot when you reach the resort and walk through the campground to the river. A recurring miracle at Mono Hot Springs that has repeated itself season after season is that is each year the spring flood from the snow melt washes a new log into perfect position to make a natural log bridge crossing the river – that inevitably shows up not long after the flood washes away last year’s log crossing! Cross over to the south side of the river and make your ascent up the hill about forty feet to “Old Pedro” – one of Mono’s hottest springs averaging around 106-107 degrees with daily variations. 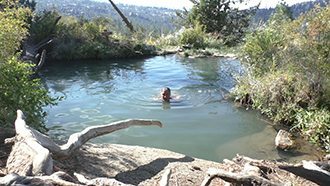 The two cement lined pools are the remnants of a bath house built by the California Conservation Corps in 1934 and offers splendid views up and down the San Joaquin to relax and enjoy the soul soothing sounds of the river and the wind whistling in the pines overhead. Old Pedro is an in and out pool – you can’t continuously stay in it without having to get out and cool down after ten or fifteen minutes – and is often best enjoyed in the afternoon when it’s in the shade. If you climb another hundred yards above Old Pedro, there are more cement lined pools known as the Reed Pools that are cooler than Old Pedro and are refreshing on hot days. If you look behind the circular cement water tank that are remnants of the old bath house you will sometimes find a hot spring outflow coming out of a pipe with a tub beneath it that’s a perfect place to sit and let the hot water pour over the top of your head that relaxes your entire being! This tank is also the source of the natural mineral hot springs that is piped across the river to the spa in the resort for people to enjoy without having to make the journey across the river and climb the slope above the river to the springs. The natural mineral content of this hot spring is listed at the bottom of this page. From the hot springs in the vicinity of Old Pedro, a person has three alternate routes for reaching the other hot springs. You can walk about 300 yards east through a muddy meadow with stepping stones you can hop on to keep from sinking into the mud to the next group of springs which are the Iodine Springs. With a hike that may be strenuous to those who have not yet gotten used to the altitude, you can also reach “Little Eden” which is a swimming pool size hot spring perched high on the ridge if you continue climbing through the steep meadows above Old Pedro and follow the water seepage running down the rocks and climb the cliff. However, this is a steep climb that many will find easier to reach Little Eden going back across the river to their cars and visit the other hot springs driving back out to Edison Lake Road and crossing the bridge over the San Joaquin and parking at the trailhead on the south side the bridge. About 100 yards down the path heading west along the river from where you parked you will see water crossing the footpath. Look up to your left to the source of the water and you’ll see a large granite outcropping with a pool called the Rock Garden nestled beside it. 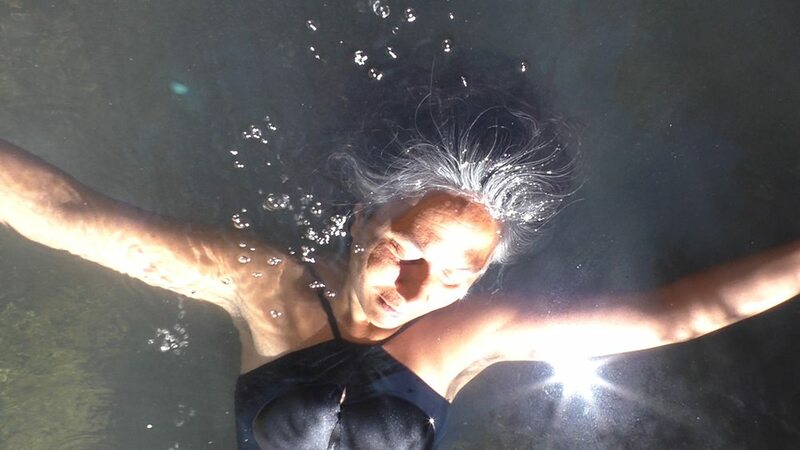 This is another of the warmer hot springs big enough for several people with beautiful maiden hair ferns tumbling into the pool above the bubbles which is the hottest part of the pool at about 104 degrees. Follow the course of the water over the rocks uphill another 30 yards and you come to the Mud Baths which is a cooler pool with a spectacular 180° views from sunrise to sunset with the river flowing through the scenic granite outcroppings below. The soft clay lining of this pool makes for excellent facials! Another 140 yards further down the path from where you climbed up to the Rock Garden and the Mud Baths are the Iodine Springs. The Iodine Springs are cement lined tubs that are deep enough to stand in and just cool enough to stay in without having to get in and out. However, never forget while you are in even the cooler hot springs, you are perspiring more water than you realize and be sure to bring plenty of drinking water to keep yourself hydrated. Below the two cement lined pools of the Iodine Springs is another natural hot spring that is underwater during the spring flood, and doesn’t emerge until the river level drops. Rocks are then placed around the outflow to help contain the hot water and make for a quick and easy cold plunge into the San Joaquin. The hot sands of this spring are hot enough that at a certain point you will want to get out to cool down. If you are lucky enough, waterspouts sometimes form here due to the way the wind passes around the rocks above the river that can lift cooling water out of the river ten feet into the air and sprinkle you with a refreshing shower without having to leave the pool! Truly wondrous things happen here! The easiest way to get to Little Eden that is a hot spring big enough to swim in is to get back into your car parked beside the bridge over the San Joaquin, and drive up Edison Lake Road one mile to where you cross a small grated bridge and park in the recessed area just above this bridge. Walk out onto the rocks below the road overlooking the basin, and when you see the resort one mile below, look to your left and you will discover a beautiful pool that defies intuition perched on the very top of a ridge – the last place you would expect to find standing water! Its easiest to circle around to your left from this vantage point and reach Little Eden going down the path on the west side of the boulders to reach the pool below. 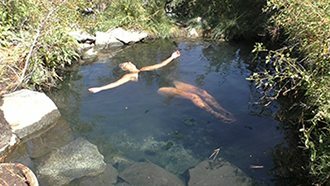 One of the beauties of California’s Mono Hot Springs are that with so many pools scattered throughout this area, you can chose which hot spring to visit depending upon how hot or cold the day is. On hot days, Little Eden is swimming pool temperatures where you can sit all day enjoying the incredible views of the Range of Light all the way to Yosemite. The white granite face of Recess Peak peeks through the gap above the Bear River. The magnificent 9945 ft Bear Dome outcropping that is one of the dominant features of the Mono Hot Springs area towers overhead up the river, and Devil’s Table downstream to the Northwest. Nearby is the smaller Rose Garden which is another of the cooler pools where you can sit without having to get in and out. 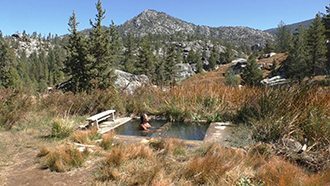 Mono Hot Springs is part of the vast geothermal area extending from Mammoth roughly forty miles to the north all the way down to Mono Hot Springs and is related to the tectonic forces that make this part of the Sierra Nevada having on average the highest peaks in California. People often ask if the drought conditions California has been experiencing is effecting the springs. A hydrologist who studied Mono Hot Springs concluded that the water coming out of Old Pedro was snow on the ground two thousand years ago, so seasonal variations in rainfall to date have not effected the springs’ flow. Still another local wonder a mile hike north of the resort is Doris Lake, a thermal heated lake that never freezes during the winter. You can pick up the trail to Doris Lake by following the signs from the General Store at the resort up through the meadow just west of the cabins with a moderate one mile climb to where the trail comes out on the south side of the lake and you will see bubbles from the hot springs surfacing near the reeds. The thermal heated water from the hot springs in Doris Lake tends to form about a nine inch layer of warm water on the surface of the lake, with colder water beneath. Be warned! There are harmless Gartner snakes in the reeds on the shore where you climb out of the lake beside the rocks. They are perfectly harmless, but can scare you if you aren’t ready for them and know they are harmless! The store clerk can give you directions that will help you to locate the springs. Also available at the resort is a facility map that illustrates the general location of many easy to find hot springs which are within a few minutes hike of the resort. Be careful not to slip on the very slick wet concrete surrounding some of the springs. Please make certain that you carry out all possessions and garbage. Since the springs are out in public forest land they are available for all to enjoy at any time. Like Sunset Magazine says, “Nobody can beat Mono Hot Springs for location” where you can enjoy high Sierra adventures relaxing and soaking in California’s most remote natural mineral hots springs accessible by automobile, live in rustic elegant charm staying at the resort’s charming cabins and enjoying fine meals of elk, buffalo ribs and fresh trout at their restaurant!